All parties are framing the deficit as a fiscal choice. They have said very little about productivity. 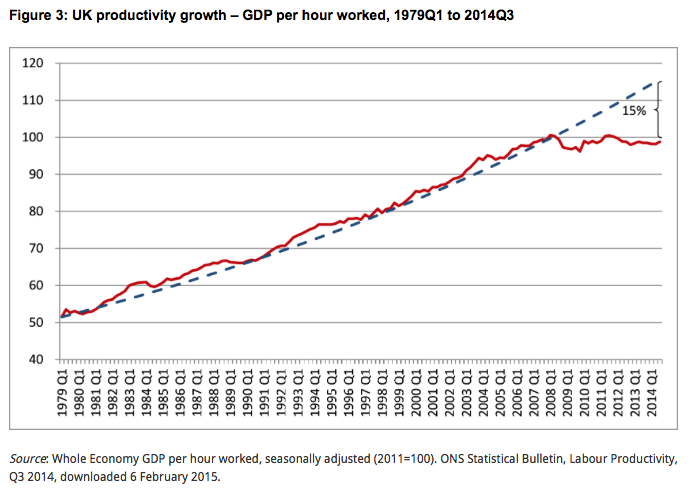 It is surprising and depressing that the Chancellor neither mentioned the productivity problem nor did anything to address it. [I]t is misleading to view the main challenge as fiscal. It has also become clearer that the crisis both revealed and caused structural weaknesses that the government has neither recognised nor addressed. The opposition Labour party shows no sign of recognising the weaknesses either. What are they? Simply, the economy is “ex-growth” — underlying growth has stopped. Against that background, the aim enunciated by the chancellor “for Britain to become the most prosperous major economy in the world” is absurd. Here are three indicators of the extent to which the economy has gone ex-growth: real gross domestic product per head at the end of 2014 was much the same as at the end of 2006; real GDP per head at the end of 2014 was about 16 per cent below what it would have been if pre-crisis trends had continued; and GDP per hour was about 15 per cent below the pre-crisis trend. 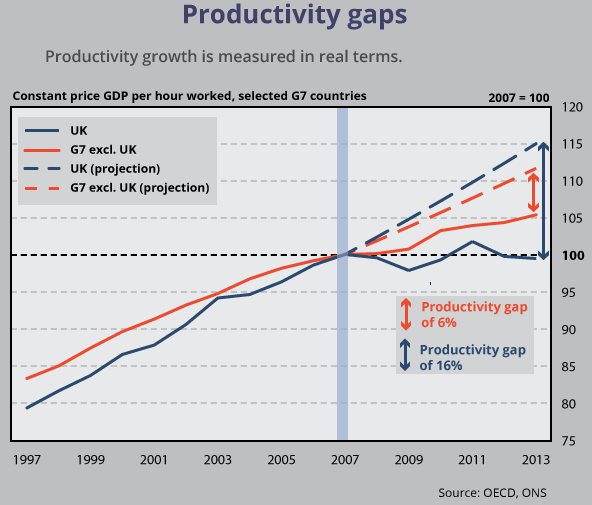 The link between productivity and the UK’s fiscal problems is neatly illustrated on these 3 charts. In each recession, productivity and per capita GDP fell, and a gap opened up between government income and expenditure. After each recession, the growth which followed meant that the economy got back to where it would have been had the downturn not happened. Until now, that is. The fall after 2007 was so great that a big gap has opened up between where we are now and where we might have expected to be given past post-recession trends. Productivity is flatlining so wage growth is slow. This means low tax revenues and continued reliance on in-work benefits, making the gap between government income and expenditure very difficult to close. 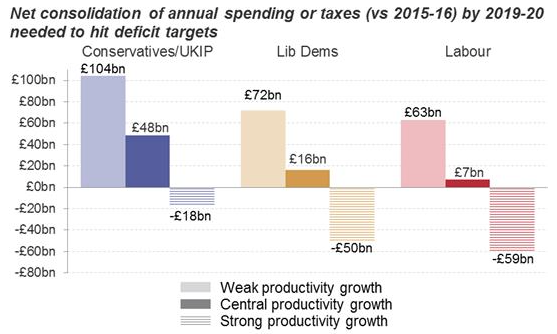 Adam Corlett of the Resolution Foundation shows the impact different productivity scenarios would have on each of the main parties’ spending plans. (The figures have changed slightly since the budget but the principle still stands.) Under the OBR’s most optimistic productivity forecast, even the Conservatives’ ambitious deficit targets could be achieved without any further spending cuts. Under the OBR’s most pessimistic scenario, even Labour’s slower deficit reduction plans would be blown away by poor productivity growth. In other words, if productivity falls short of the OBR’s central forecast, we’re in serious trouble. As a recent ONS report showed, productivity has fallen short by comparison with previous decades and with other major economies. Productivity slowed almost everywhere after the financial crisis. But the picture is especially dismal in Britain. Output per hour worked is still 2% below its pre-crisis peak; in the rest of the G7 group of rich countries it is 5% higher. The French could take Friday off and still produce more than Britons do in a week. Confounding stereotypes, Italians are 9% more productive. Britain’s workers are a bargain all the same, because their pay is so pitiful. Of the 15 initial members of the EU, only Greece and Portugal now have lower hourly wages. A British employee produces a fifth less than a French one, but he or she is more than a third cheaper to hire. For firms, this is wonderful. Unlike real wages, which remain 8% below their 2007 peak, company profits are almost back at their pre-crisis level (and for service companies they have never been higher). The country is running up against the limits of what can be achieved simply by boosting employment. With the recovery nearly complete, the next task for the island of cheap workers is to work out how to become an island of rich ones. Without productivity and wage growth, we are looking at significant tax increases or else the dismantling of some parts of the state. 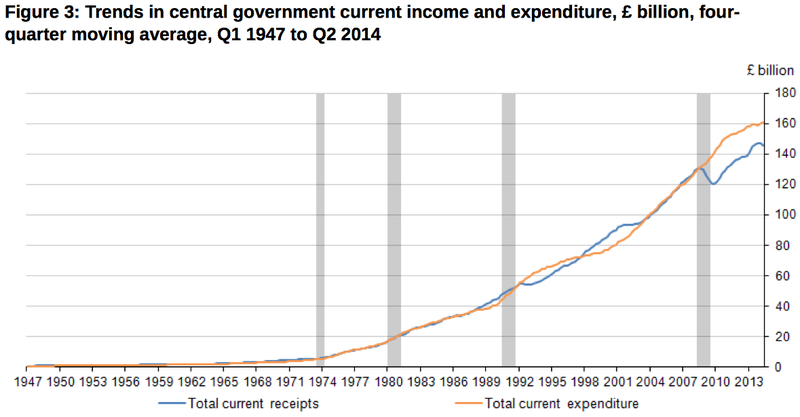 The size of the next government’s spending dilemma depends on how far productivity increases over the next 5 years. We continue to assume that productivity growth will pick up slowly to more normal rates, but that remains the most important and uncertain judgement in our forecast. If, as some people fear, the OBR’s forecasts are on the optimistic side, whoever wins on 7 May will find themselves with an even bigger fiscal headache than they thought. 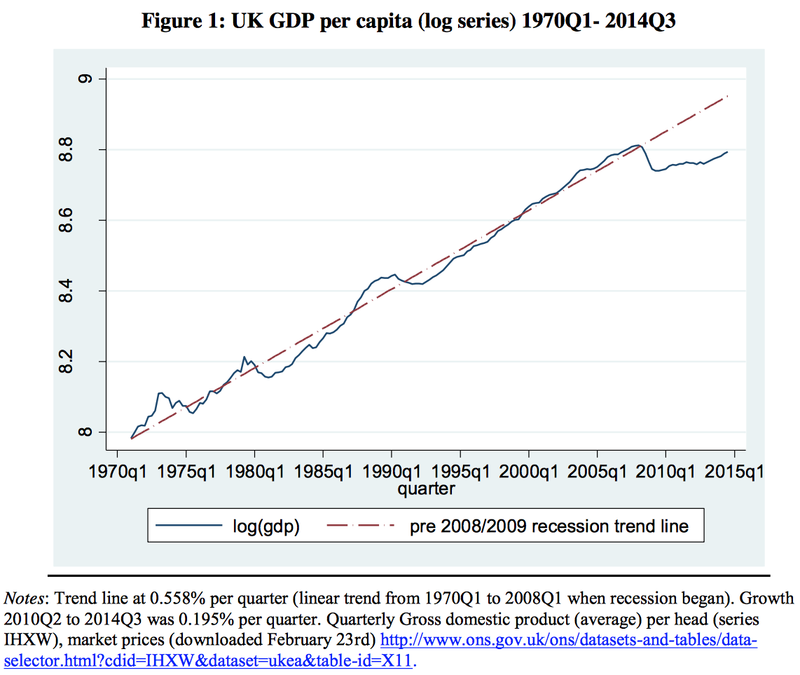 Britain’s recovery is weak. Some public services could disappear completely over the next five years. Yet, the Conservatives want to deliver tax cuts for the rich. And no one is talking about the real issue: productivity. And the fact that our over-bearing financial services industry almost ensures we don’t invest in productive assets (80% of bank loans go on property and other non-productive investments). The UK’s political elite is talking to us from a parallel universe. At the risk of sounding like a UKIP supporter (which I’m most certainly not! ), surely the immigration has had something to do with this problem? For example, if it’s cheaper to employ three fit young men armed with buckets and sponges to clean my car in a supermarket car park as opposed to using an automatic car wash then productivity falls. Furthermore, that automatic car wash (even assuming it’s not made in the UK) still needs a skilled technician to maintain it and make occasional repairs. By employing three blokes we’re de-skilling the economy. I wouldn’t go overboard with comparisons with France. One of the reasons French industry is obsessed with automation and efficiency is the hassle of hiring and the real hassle of firing employees. Consequently, levels of unemployment in France are very high, especially among the unskilled or semi-skilled.